A fabrication company in State Line is making a new stove that can burn more efficiently and meet strict Environmental Protection Agency (EPA) guidelines, and it just might be able to beat out international competitors in a wood stove design challenge in Washington D.C. this fall. The Optimum stove, made by 509 Fabrication right on the Idaho border, was invented by a friend of the company's owners in Hayden, Idaho, several years ago. "It’s more like a wood stove than a pellet stove, but it still burns biofuel," says Dusty Henderson, who owns 509 Fab with his father Gary. "Frank Reed built and designed the first model. He had it in his shop. He kind of did it on a dare that somebody told him you couldn’t burn one piece of wood at a time." Instead of feeding chopped logs into the front of the stove, pressed logs made out of sawdust are placed in a tube on top, stacked end on end to feed themselves into the fire. Depending on the settings, Henderson says that the stove can burn on its own overnight without being stoked. Part of what makes the stove so efficient is an improved design made after Henderson and his dad bought the right to patent it. In the original design, the feed tube was at about a 70-degree angle, Henderson says, but the new design is at 90 degrees, which makes more space for metal tubes that absorb the heat, which is then blown out to the room by a fan. "Your logs are stacked on end, and as your bottom log burns, you’re burning about 4 inches at a time," Henderson says. "Your upper logs push it down, so it burns down." The fuel burns so hot and efficiently that there isn't an ash pen to collect ashes, Henderson says. "The ash accumulates outside of the firebox and you only have to clean it every 14 days or so," if you're running the stove 24/7, he says. By 2020, all new stoves have to meet new strict EPA guidelines on how many grams of particulate-matter pollution are created per hour of use. For pellet stoves, that requirement is no more than 2 grams per hour. "Back in the '80s, wood stoves would put out 60 to 80 grams of emissions an hour," Henderson says. "We came in at 1.49 grams of emissions. The industry's come a long ways." 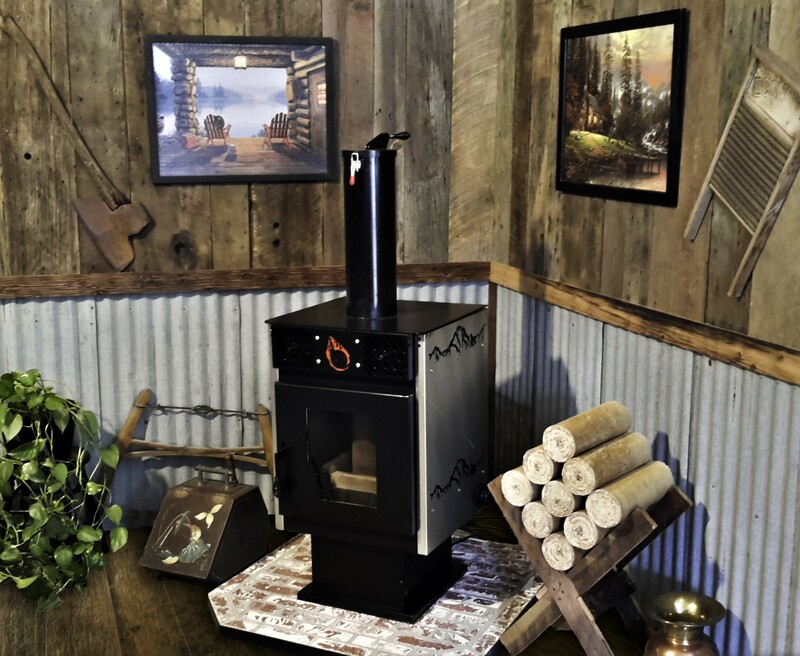 The 509 Fab stove will be one of a dozen to compete in the Alliance for Green Heat's fourth Wood Stove Design Challenge starting Nov. 9, which is designed to inspire innovation in home heating, where there hasn't been as much advancement as with other tools used in daily life. The teams will compete for up to $50,000. "Wood stoves are still used by 30 – 60 percent of homes in hundreds of rural and suburban counties around the country," an Alliance for Green Heat announcement of the event states. "Yet, the technology revolution that has swept household appliances in the last 20 years has bypassed wood stove technology." One part of the competition will include other stove designs that integrate thermoelectric elements to generate electricity for everything from batteries to cell phones or lighting. For 509 Fab's stove, the competition is about automating the stove heating process. The stove is currently being sold factory-direct to consumers until the company sets up a base of dealers.